We didn't actually meet anyone in person, the people we spoke with on the phone were always polite. No front desk that's the best I can say. The property was clean and well maintained. Easy to find. The lock codes are emailed to you in advance. Really no amenities for the price, but I guess you are paying for Lutsen. Check in time is 4PM. This property did allow to book just one night, others in the area were requiring 2 nights, however we were charged an extra fee for the one night stay. Overall it was fine for what we needed. I didnt make the arrangements, and they were all done online by my husband, but he said everything was fine. We did like the little note left to us by the housekeeper. 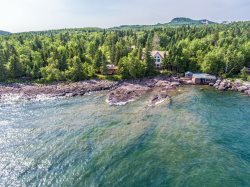 Sunrise Hollow is a spectacular vacation rental, perched right on the shore of Lake superior. We enjoyed the separate cabin. Very good information and communication! Fox Cove is a great location! Love the dining room. The bed was very comfortable. Shower was great. Love the gas stove. The wi-fi worked off and on. It made me want to come back and stay again!